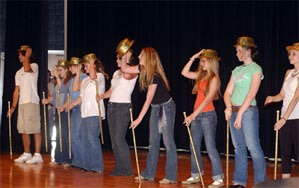 A theatre camp for middle and high school students! Final Performance: The final performance (open to the public and free of any admission charge) will be on Friday, July 19th at 7:00pm at Montrose Area High School Auditorium. Sign up today! Participants must be at least 10 years old and have completed at least 5th grade in the current (2017-2018) school year. Download the EdCamp 2018 Brochure or email us for full details and registration information. We look forward to seeing you there! A limited number of scholarships are available to those who demonstrate financial need. To request a scholarship application, email us. Scholarship applications must be postmarked by June 9, 2018. Theatre Camp is an opportunity for middle and high school students in 5th thru 12th grade to attend a week-long camp full of workshops and clinics led by professional performers and teachers in the art of theatre and musical theatre. At the end of camp week, students present a final performance that is open to the public. Ed Lonzinski was involved in various community theatres, participating in performance aspects as well as all areas of production. Directing for Greene (N.Y.) High School, Ed realized the value of educating students in the art of theatre, and he strived to allow his students to participate in theatre festivals offered in more urban regions. It was the desire of Ed, who was to serve on the board of EMTC, to offer students high-level experiences in the art. Through the generosity of his parents, Dolly and Mike, a fund was established to create a living memorial to this extremely committed and talented young man.